The objective of this study was to investigate the prevalence of hepatic cysts by age and gender in patients with early autosomal-dominant polycystic kidney disease (ADPKD) and to determine whether hepatic cyst volume is related to renal and renal cyst volumes by using magnetic resonance imaging (MRI). A total of 230 patients with ADPKD (94 men and 136 women) who were aged 15 to 46 yr and had relatively preserved renal function were studied. MRI images of the kidney and liver were obtained to measure renal, renal cyst, and hepatic cyst volumes. These volume measurements and hepatic cyst prevalence were compared in all patients and in subgroups on the basis of gender and age (15 to 24, 25 to 34, and 35 to 46 yr). The overall prevalence of hepatic cysts was 83%; the prevalence was 58, 85, and 94% in the sequential age groups and 85% in women and 79% in men. The prevalence was related directly to renal volume (χ2 = 4.30, P = 0.04) and to renal cyst volume (χ2 = 5.59, P = 0.02). The total hepatic cyst volume was significantly greater in women than in men (a logarithmic transformation mean of 5.27 versus 1.94 ml; P = 0.003). The average hepatic cyst volume was 0.25, 5.75, and 22.78 ml in sequential age groups. Hepatic cysts are evident in 94% of patients who are older than 35 yr and in 55% of individuals who are younger than 25 yr. Hepatic cysts are more prevalent and larger in total cyst volume in women than in men. Hepatic cyst prevalence and aggregate total hepatic cyst volume increased with age. Autosomal-dominant polycystic kidney disease (ADPKD) is the most common genetic renal disorder and characterized by renal cyst growth and enlargement leading to renal failure (1). ADPKD is a multisystem disorder and affects other organs as the disease progresses. Hepatic cysts are one of the most common extrarenal manifestations in ADPKD, occurring in the majority of the patients with ADPKD after the fifth decade of life (2). Although hepatic cysts are rarely associated with liver dysfunction or failure, they may cause abdominal pain, bloating, dyspnea, cyst infection or hemorrhage, and ascites (3–8) and thus influence the quality of life. The natural history of hepatic cysts in patients with ADPKD (2,6,9–16) or isolated autosomal-dominant polycystic liver disease (12) has been studied extensively. Many of these studies focused on the prevalence of hepatic cysts associated with age, gender, and various clinical parameters such as renal function and hypertension (2,6,9–12). Some studies evaluated the number, size, or severity of hepatic cysts using ultrasound (6,13) or computed tomography (CT) imaging (11,14–16). However, to our knowledge, comparative evaluation of the volumes of the kidney and renal and hepatic cysts in association with gender and age has not been made in a relatively large cohort of patients with ADPKD. Recently, the Consortium for Radiologic Imaging Studies of Polycystic Kidney Disease (CRISP) was created to develop and apply imaging methods to measure reliably and accurately cyst and renal volumes in patients who have ADPKD and are early in the course of their disease (17). The CRISP study provides a database of uniformly and rigorously collected magnetic resonance imaging (MRI) data, renal functional parameters, and other selected markers of disease progression, which allows us to correlate imaging data with functional changes in patients with ADPKD and various rates of progression. The purpose of the study described in this article was to investigate the prevalence of hepatic cysts by age and gender in patients with early ADPKD and to determine whether hepatic cyst volume is related to total renal and renal cyst volumes and patient demographic data by using quantitative MRI scans. The study protocol for the CRISP was approved by the institutional review board at each participating site, and informed consent was obtained from all of the patients. At recruitment, the CRISP study patients were patients who had ADPKD, were between 15 and 46 yr of age, and had relatively preserved GFR (i.e., a 24-h creatinine clearance >70 ml/min per 1.73 m2 or a Cockcroft-Gault estimate of creatinine clearance >70 ml/min) to participate. Men were eligible when their serum creatinine concentrations were <1.6 mg/dl, and women were eligible when their serum creatinine concentrations were <1.4 mg/dl. Only the kidney was imaged during the first year of data collection. Starting with the second year, the imaging protocol was revised and extended to include volumetric measurement of hepatic cysts. A total of 230 patients from four clinical centers (Mayo Clinic, Emory University, University of Kansas Medical Center, and University of Alabama at Birmingham) were included in our study. Limited by the CRISP study inclusion criteria, we did not investigate patients with impaired renal function (i.e., a Cockcroft-Gault estimate of creatinine clearance ≤70 ml/min at the recruitment) in this study. The standardized MRI protocol for the CRISP study was implemented in 1.5-T MRI scanners. A phased-array surface coil was positioned with its center over the inferior costal margin, estimated as the upper margin of the kidney. Scout scans were performed to locate the scan range of the entire kidney. From the scout axial images, the coverage for the most anterocaudal and posterocranial aspects of the kidneys was determined. The field of view was maintained between 30 and 35 cm. The kidneys were imaged first posteroanterior in the coronal plane using T2-weighted single-shot fast spin-echo (SSFSE/HASTE) sequence with fat saturation at 3-mm fixed slice thickness during breath-hold(s). For small kidneys or for a patient who can take a long breath-hold, one set of images obtained during a single breath-hold would be sufficient to cover the entire kidneys. For large kidneys, however, more than one set of images would be required, where neighboring image sets were overlapped by one slice. Then, a new set of images were obtained to cover the entire kidneys during a single breath-hold (typically, slice thickness of 3 to 6 mm depending on the size of the kidney and on the patient’s breath-holding capability). This imaging sequence with the same slice thickness (i.e., adjusted slice thickness) then was repeated over the anterior abdomen to cover the liver. When more than one breath-hold was required to cover the entire liver, neighboring image sets were overlapped by one slice. After T2-weighted images were obtained, breath-hold coronal, three-dimensional spoiled gradient interpolated (SPGR/VIBE) T1-weighted images without fat saturation at 3-mm fixed slice thickness were obtained. After this acquisition, 0.1 mmol/kg gadolinium was injected at 1 ml/s. T1-weighted imaging sequence was repeated 120 and 180 s after the start of the gadolinium injection. To choose the best set for the volume measurement, we reviewed both sets of postgadolinium T1-weighted images acquired at 120 and 180 s and evaluated their image quality including the uniformity and the degree of enhancement in the renal parenchyma. Commonly, the set acquired at 120 s was selected. After the MRI scans were coded to maintain the security of the identity of the participant, the scans were transferred via secure Internet transmission with Digital Imaging and Communications in Medicine encoding from the four centers to the Data Coordinating and Image Analysis Center, and the images were retrieved to a secure workstation. Renal volumes were measured on the postgadolinium T1-weighted images using a stereology method. The pregadolinium T1-weighted images were used to measure the complex cyst volume but not for the total renal volume. The stereology method has been used widely for image-based volumetric measurements of a variety of organs (18–22) because it provides a fast and reliable measurement of area of an object. Its measurement is based on counting the number of intersections of a randomly oriented and positioned grid over the object. In our application, the area of the kidney in each image was calculated from the collection of selected points that overlaid the kidney regions and by converting the point count to a pixel count for the area measurements (17,18). The total renal volume was calculated from the set of contiguous images by summing the products of the area measurements and the slice thickness. Because of their water content, cysts demonstrate signal intensities higher than the background renal and hepatic parenchyma in T2-weighted images. Some complex cysts, particularly frequent in the kidney, may not show high signal intensities in T2-weighted images. These cysts, however, present as cysts with high signal intensities on pregadolinium T1-weighted images and thus are measured on T1-weighted images. Renal and hepatic cyst volumes were measured from T2-weighted images, specifically, renal cyst volumes from T2-weighted images with a fixed slice thickness of 3 mm and hepatic cyst volumes from T2-weighted images with adjusted slice thickness (3 to 6 mm). The cysts were identified and segmented from their background parenchyma using a region-based thresholding method (17,18). A threshold was selected interactively by an analyst on T2-weighted images. Cysts were segmented from voxels whose intensity values were greater than the threshold. Cyst areas were calculated in each image, and the total cyst volume was calculated from each set of contiguous images by summing the products of the area measurements and the slice thickness. Venous structures in the liver that might appear as bright structures on T2-weighted images were usually excluded from the measurement with the region-based thresholding method, because their signal intensities are below the threshold for the cysts. Any large venous structures such as central portal vein branches remained after the application of the thresholding method were outlined manually and excluded from the cyst volume measurement. Clinical and laboratory findings were obtained by a well-defined prospective examination protocol (17,18). Total renal volume (i.e., summed total of both kidneys including renal parenchyma and cyst volumes), bilateral summed renal cyst volume, hepatic cyst volume, and hepatic cyst prevalence (i.e., the percentage of individuals with at least one hepatic cyst) were compared in all patients and in subgroups based on gender and three age blocks (15 to 24, 25 to 34, and 35 to 46 yr of age at the time of recruitment). We found that a small number of hepatic cyst volume measurements were much larger than the remaining majority of the measurements. Because of this extremely skewed distribution, all statistics on hepatic cyst volume and total renal volume were subjected to a log transformation. For livers without any detected cysts, the size of the smallest hepatic cyst (0.04 ml) was used for the continuous analyses. For ease in interpretation, mean values were transformed back to original units (ml) for presentation. ANOVA models were used to assess the relationship of age and gender to hepatic cyst volume. An ANOVA-like analysis of binary data (Genmod Procedure in SAS with an identity link function) was used to test age and gender effects on hepatic cyst prevalence. Pearson correlation was used to estimate correlation coefficients. Data analyses were conducted using SAS 8.02 for Linux (SAS Institute, Cary, NC). There were 94 men and 136 women. Their ages at the time of acquisition of the hepatic MRI scans ranged from 16 to 47 yr (mean 33.6 yr), and the GFR (estimated by renal iothalamate clearance) averaged 99.2 ml/min (range 40 to 173 ml/min per 1.73 m2). A wide range of hepatic cyst burdens was observed (0 to 4673 ml; Figure 1). The overall least square mean was 3.20 ml. The mean volume was 5.27 ml for women and 1.94 ml for men. The total hepatic cyst volume was significantly higher for women (P = 0.003). Thirteen patients who had >1000 ml of hepatic cysts all were women. The largest hepatic cyst volume in men was 834 ml. The average hepatic cyst volume was 0.25 ml for those who were younger than 25 yr, 5.75 ml for 25- to 34-yr-olds, and 22.78 ml for those who were ≥35 yr of age (F = 45.29, P < 0.0001). 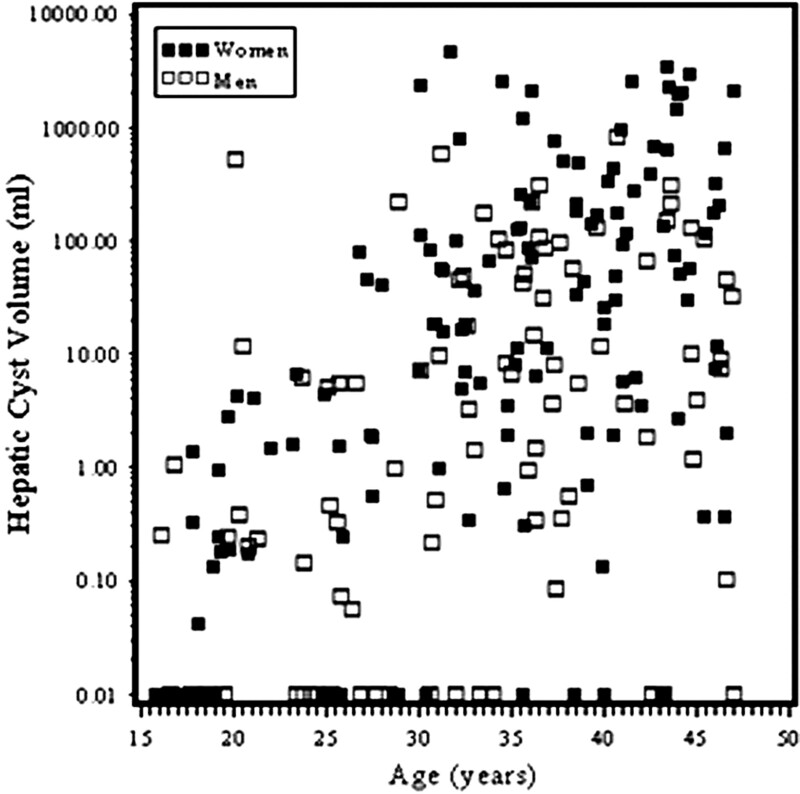 The mean volume of hepatic cysts in women was 0.22, 11.96, and 55.80 ml from the younger to the older groups (Figure 2). In men, the means were 0.29, 2.76, and 9.30 ml, respectively. The interaction of age and gender failed to reach statistical significance (F = 7.38, P = 0.09). Coronal T2-weighted magnetic resonance imaging (MRI) from four different patients with variable severity of hepatic and renal cysts. Patient A is a 24-yr-old man with mild degree of hepatic cysts (a total volume of 6.3 ml) and renal cysts (15.4 ml). Patient B is a 46-yr-old man with mild hepatic cyst (9.3 ml) but severe renal cyst burden (1940 ml). Patient C is a 44-yr-old man has moderately severe degree of hepatic cysts (318.7 ml) but mild renal cyst burden (37.6 ml). Patient D is a 30-yr-old woman with severe degree of hepatic cysts (2368.8 ml) and renal cysts (1084.5 ml). Relationship between hepatic cyst volume and age in women and men. 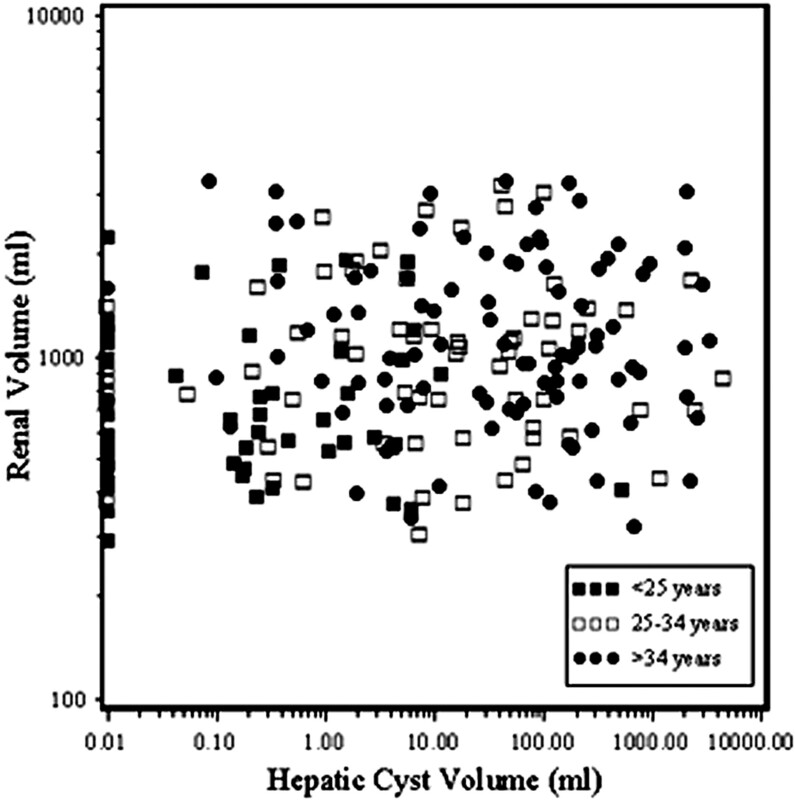 A significant correlation was observed between the hepatic cyst volume and total renal volume (r = 0.22, P = 0.001; Figure 3) and renal cyst volume (r = 0.24, P = 0.0002). However, the correlations disappeared when age was held constant (Table 1). Relationship between hepatic cyst volume and renal volumes in three age groups. The overall prevalence of hepatic cysts in patients with ADPKD was 83% (Table 2). The prevalence was 85% in women and 79% in men (χ2 = 1.06, P = 0.30). The older group had the highest prevalence (94%), and the younger group had the lowest prevalence (58%; χ2 = 36.96, P < 0.0001). The prevalence of hepatic cysts was related directly to renal volume (χ2 = 4.30, P = 0.04) and to renal cyst volume (χ2 = 5.59, P = 0.02; Figure 4). The average renal volume (1004 ml) and renal cyst volume (414 ml) were higher in those with hepatic cysts than in those without (renal volume of 712 ml and renal cyst volume of 192 ml; P = 0.0005 and P = 0.0001, respectively). 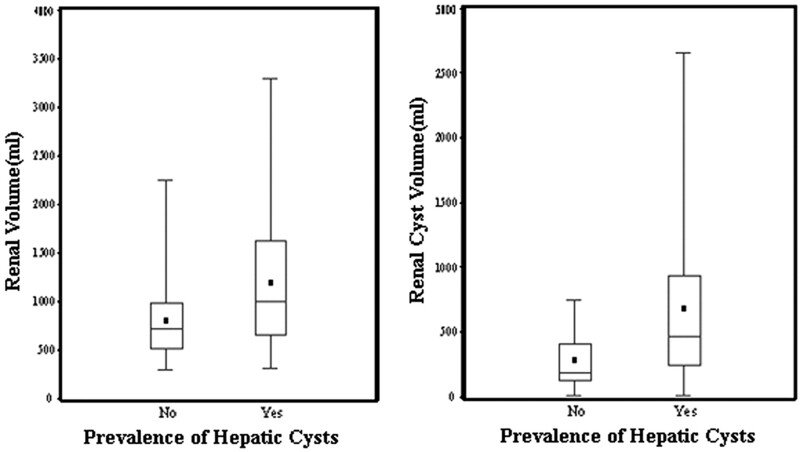 Box plots showing the relationship between the prevalence of hepatic cysts and renal (A) and renal cyst (B) volumes. Hepatic cysts are the most common extrarenal manifestation of ADPKD (23). Hepatic cysts are reportedly rare in children but appear more frequently with advancing age and renal cystic disease (6). The prevalence of hepatic cysts in patients with ADPKD is reported to be 10 to 25% in the third decade to 75 to 80% by the seventh decade of life (2,6,10,11,23). This is much higher than the reported prevalence of hepatic cysts in the general population (24,25). A recent ultrasonography-based study by Nicolau et al. (13) reported that an overall prevalence of hepatic cysts in patients with ADPKD was 67%; the prevalence of 22% for patients who were younger than 30 yr but the prevalence of 95% for patients who were 40 yr of age. In our study, hepatic cyst prevalence was even higher: 83% (190 of 230 patients) overall and 58% in patients 15 to 24 yr, 85% in patients 25 to 34 yr, and 94% in patients 35 to 46 yr of age. The high prevalence of hepatic cysts in our study cohort of relatively preserved renal function indicates that the relatively late onset of the liver abnormality in some patients is not the consequence of a uremic environment. The detection of cysts in relatively young patients exemplifies the superiority of MRI over ultrasound for imaging small cysts and probably accounts for the larger prevalence in early-stage disease than reported previously. As a reference comparison, the prevalence of hepatic cysts in patients who are younger than 40 yr in general population was reported to be 1% or less (24,25). Our data demonstrate that the overall prevalence of hepatic cysts was slightly higher in women (85%) than in men (79%), but the difference was not statistically significant. This result is concordant with that reported by others (6,13). We found, however, that this difference in gender-related prevalence is dependent on age. The average volume of hepatic cysts was higher in women (5.27 ml) than in men (1.94 ml). Although there was no substantial difference in the volumes between women and men in the 15- to 24-yr age group, at older ages the differences widened. We speculate that the marked increase in hepatic cyst volume among women 25 to 34 yr of age may reflect the combined impact of oral contraceptive use and pregnancy in this age group, as reported in previous studies (6). Further longitudinal analyses will address these issues. To our knowledge, no quantitative evaluation of hepatic cysts has been previously reported using MRI. The majority of the published studies on ADPKD-related hepatic cysts were based on limited quantitative data: Commonly, the presence of hepatic cysts and, occasionally, the number and severity of hepatic cysts. Measuring the volume of hepatic cysts is very difficult with ultrasound imaging. Several previous quantitative studies were performed using CT imaging (11,14–16). Notably, Everson et al. (14) measured the volumes of hepatic cysts, liver, and kidney from CT images of 25 patients with ADPKD. They found that women were uniquely susceptible to massive hepatic cystic disease and that total renal volume, a measure of renal cystic disease, did not correlate with the volume of hepatic cysts. Moreover, this group also showed that postmenopausal women who were receiving hormone replacement therapy exhibited a faster rate of hepatic enlargement than those who were receiving no hormones (26). Thus, endocrine factors seem to have a role in determining how rapidly hepatic cysts enlarge in women with ADPKD. The mean volumes of the kidney and renal cysts were higher in the patients with hepatic cysts than in the patients without hepatic cysts. More than likely, the tendency for renal and hepatic cyst volumes to increase was related more to age and duration of disease than to specific linkages between the two organs (6,13). There are intrinsic limitations in the imaging methods that would affect the accuracy of cyst volume measurements in the liver. Minimal size detection depends on the spatial resolution of MRI and the contrast resolution or signal difference between the background hepatic parenchyma and cyst. The hepatic cysts are typically much brighter than the hepatic parenchyma in T2-weighted MRI scans, thereby providing good contrast resolution. If we assume that the smallest diameter of a hepatic cyst to be resolved is related directly to the slice thickness of the MRI scans (4 mm; commonly used slice thickness for hepatic cyst imaging in this study) and assume spherical cyst shape, then the volume of a cyst that corresponds to 4 mm in diameter is approximately 0.03 ml. It is likely that some tiny cysts may not be detected because they are below the resolution of MRI or are located between neighboring image planes and subject to a partial volume averaging. Considering these undetected cysts, the true prevalence of hepatic cysts may be even higher than 94%. However, there could be false-positive detections for some tiny cysts as a result of imaging system noise or artifacts, which is a potential pitfall and intrinsic limitation of image-based detection or measurement methods. In conclusion, MRI demonstrated that hepatic cysts are common among the relatively young individuals with ADPKD and preserved renal function. Although hepatic cyst volume and renal size of these patients increased with age, no evidence of direct linkage between these organs was uncovered in this study. The prevalence of hepatic cysts seems to be similar in women and men; however, women in the child-bearing period experienced a larger burden of hepatic cysts than men, implicating gender-specific hormones in the pathogenesis of hepatic cyst enlargement. This work was supported in part by PHS Grants M01-RR00039 (Emory University), M01-RR00052 (University of Alabama at Birmingham), and M01-RR00585 (Mayo Foundation) from the General Clinical Research Centers Program, National Institutes of Health, National Center for Research Resources.